If you are a game lover, you must be far from alien to Twitch, an online live-streaming video broadcast site for gaming. As a paradise site for gamer, you can watch other players fighting on a game battle, listen to the running-commentary and learn their strategies at the same time. VOD (Video on Demand) is a practical feature on Twitch intended for users to store past streamed broadcast when they have missed their favorite streamers’ playing. However, it is not always possible to view these saved Twitch videos online, either because the videos have expired, or they have been removed, or simply because you can’t connect to any Internet source. So it makes sense to download them and store them locally for viewing offline later. If you have no idea how to download Twitch videos and save them to your computer for offline watching, you can find 3 best Twitch video downloader here. Whenever you want to save Twitch videos free, you can resort to a desktop Twitch video downloader, because it’s quite easy to handle and doesn’t require too many steps to be taken. Of all the Twitch video downloader on the market, it’s recommendable to use Gihosoft TubeGet, as it’s quite novice-friendly for the intuitive layout and operations. Below are the steps to download Twitch past broadcast videos on Windows & Mac platform with Gihosoft TubeGet. To find the VOD video, you can either search for it by inputting keywords in the search bar, or click the “Browser” button to flip through all the streamed contents on the page by scrolling up and down your mouse. You can also search for the video one by one on the specific channels, like Top Live Channel, Top PS4 Channels, or Top Xbox One Channel etc.. Step 2. Once you’ve found a video that you wish to download, find the URL at the top of the page and copy it. Head to the Twitch video downloader you have just installed, then click the red-and-white button “+ Paste URL” to let the link pasted and parsed. Step 3. Wait for the software to parse the link. After that, set your ideal parameter and location on the pop-up resolution dialog box. Step 4. Click the “Download” button and start to save your source video or audio. You know the scenario well: you install a desktop software on your PC when you want to do something, like cutting a video, or capturing a screenshot. You utilize the software to finish you work, then you just leave it alone because you have no need to use it anymore. At this point, you have to uninstall it to free up the compute space, it’s not that difficult but quite inconvenient. In this situation, you can try an online site to complete your work without the bother of installing any other software to fill in superfluous space. 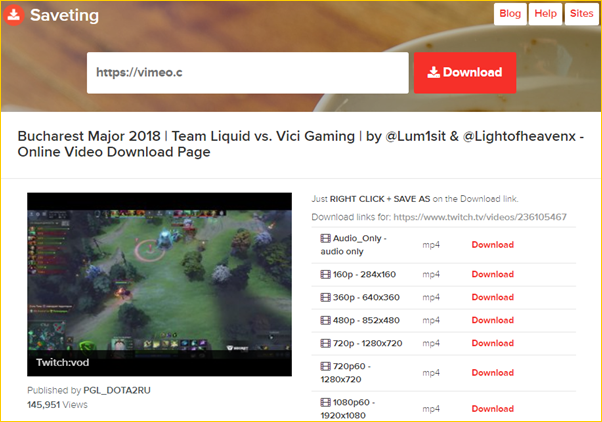 When it comes to downloading Twitch videos, you can also try an online Twitch video downloader site to save Twitch videos online to your computer, Android & iPhone devices. Today I will introduce Saveting to you, the best online Twitch video downloader I’ve ever seen. Below I will show you how to use Saveting. Step 1. Find the past streamed Twitch VOD videos you are waiting to download, then copy the link preparing for the step ahead. Step 2. Paste the URL in the input form of Saveting and hit the Download button. Choose the file resolution & format you’d like to download, you can choose to download the video or audio from the Twitch video. Step 3. Save the video to your destination. After completing the download, you can play it on your PC, Mac, Android & iPhone devices with the video player. Extensions are small software programs on the browser that enable users to customize functionality and behavior for individual needs and preferences. 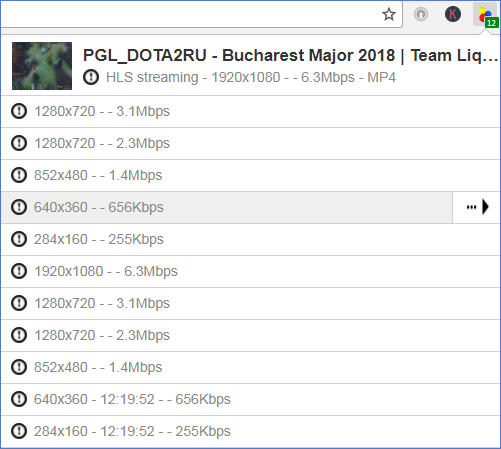 Apart from desktop and online Twitch video downloader tools, you can also use an extension – Video DownloadHelper, to save videos from Twitch easily. It is compatible with both Chrome and Firefox browsers for now. Now let’s see how to save Twitch videos on your computer with this plugin. Step 1. Go to Chrome Web Store and find Video DownloadHelper extension, click the “ADD TO CHROME” button to install this extension on your Chrome. Step 2. Head to Twitch and search for your favorite video, play it on the page. Now you can see a colored 3-balls icon in the browser toolbar if the plugin works normally. Click on the 3-balls icon to open the main panel. Step 3. On the main panel, you’ll find a list of download options of different resolutions. Choose your ideal download parameter, and click it. Step 4. Now you come to download list. You can choose “Quick Download” or “Download” option. 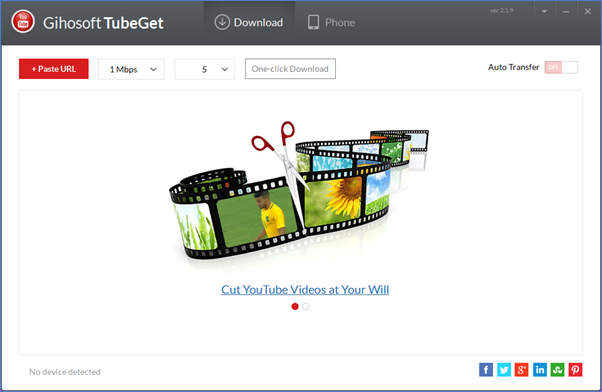 “Quick Download” option allows you to download video without asking for the destination, “Download” option enables you to choose where to put your source video. Step 5. Click the Download button and your video will be soon saved on your disk. I’ve shown you 3 best Twitch video downloader to download Twitch VOD videos for free. And I hope this tutorial will help you get a clear idea of how to download your favorite videos from Twitch. Don’t forget to let me know if you have any question regarding how to use these Twitch video download tools.